This is such a simple smoothie but it packs a serious punch! Admittedly I don't have the best immune system and I'm prone to colds and flu most winters. So when the boyfriend came down with a bad cold, a rare occurrence, I was pretty sure I was bound to be shot down next. In what I thought would be a fruitless preemptive attack, I tried to boost our intake of vitamins by throwing together this smoothie. So no, this smoothie would be the miracle cure to all your aches and pains, but it will help to keep you from contacting all the yucky bugs lurking around this winter. I drank this daily and remained sickness free whilst looking after him and whilst working in a badly ventilated office, a breeding ground for contagions. I used a magic bullet, but really any blender will do. 1. 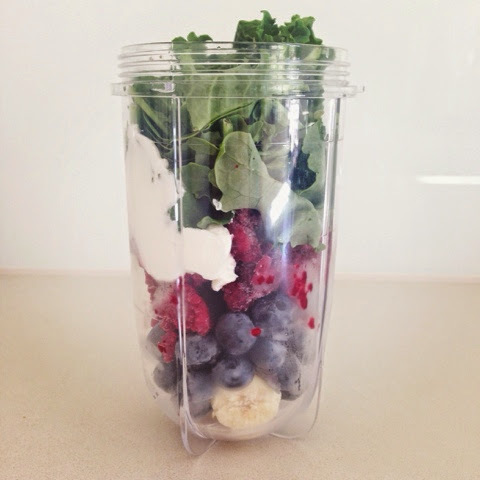 Throw the banana, blueberries, raspberries, yogurt, spinach and kale into the blender. TIP: I keep my blueberries, banana (pre-sliced) and raspberries in the freezer so that they double as ice cubes. This way my smoothies are perfectly cold and creamy!